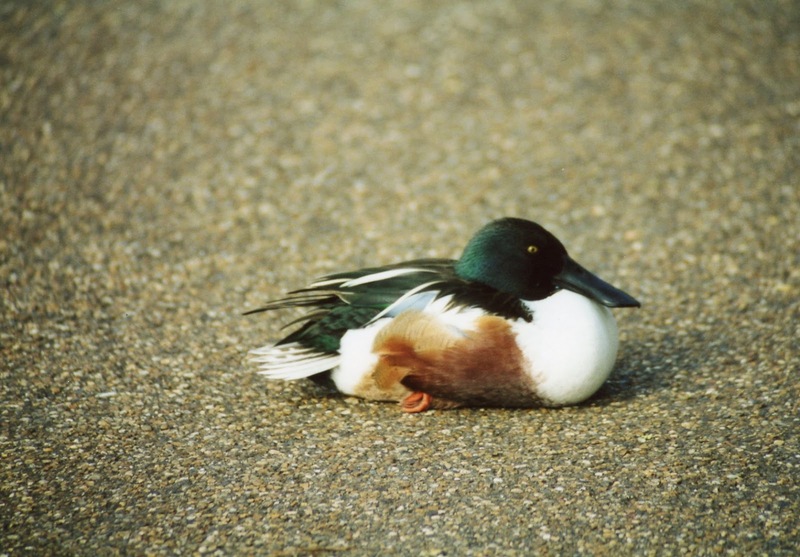 There is one male Northern Shoveler at Melbourne's Western Treatment Plant. He's lost his way from the northern hemisphere and taken up residence amongst our local ducks. Each winter, thinking that it's the northern hemisphere summer, he dons his breeding plumage, and his white breast stands out amongst the other ducks. Otherwise, in eclipse plumage, he blends into anonymity. 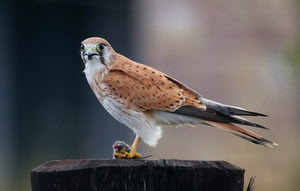 I first saw him in May 2004, when he appeared at a part of the farm where birders are not allowed to go. A few keen twitchers were guided into this restricted area by Melbourne Water's resident ornithologist. And a great day we had too. (Let's face it, any day you get a lifer is a great day.) Then in August 2011, he put in another appearance. That year, I saw him in the sea, from the bird hide. This year he appeared in Lake Borrie, and sightings of him were sufficiently regular to entice a birdy friend down from Sydney to twitch him. There were quite a few people at Werribee yesterday, attracted by the possibility of seeing a Northern Shoveler. There was some drizzle in the morning, but there was little wind and the birding was great. Once we'd ticked our target species, all stress had gone and we settled down to enjoy ourselves. We managed 70 species for the day. Yes, I know others achieve 100 without any effort, but this is May, and I was quite happy with 70. As usual, we saw plenty of raptors. There were lots of Black-shouldered Kites, Swamp Harriers, Brown Falcons and Whistling Kites. We had wonderful sightings of a Spotted Harrier and a White-bellied Sea-Eagle sat atop the artificial forest, surveying his kingdom. Banded Stilts have taken up residence at Werribee at the moment and have pushed the Black-winged Stilts into the sea. Banded Stilts are very handsome birds. I'm delighted to be able to enjoy them at Werribee. We had great views too of Striated Fieldwren (at the gate near the boat ramp on Beach Road) and Little Grassbirds, which I hear much more often than I see. We saw a few Australian Spotted Crakes and some sweet Zebra Finches. We went home very happy with our day's birding, and, needless to say, our Sydney friend was delighted with his tick. When I wrote of my visit to Alice Springs, I did not have any decent photo of the dear little bird that drew me there, so I posted one I'd taken myself. Now, thanks to Brian Johnston, I do. 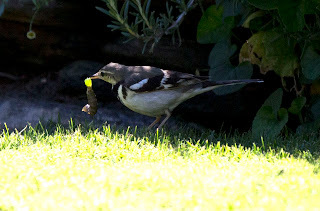 Brian was there enjoying the bird at the same time as I was and he has kindly sent me some photos to share with you. 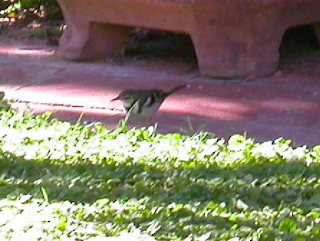 Here's the bird with the large caterpillar Mike mentioned. It was quite spectacular watching the bird eat this huge meal, squirting its stomach contents over the lawn. As I said previously, this was the first time I've ever jumped on a plane to see a rare bird. I doubt it will be the last. Thank you, Brian, for the beautiful photos! I'm sure we all appreciate them. 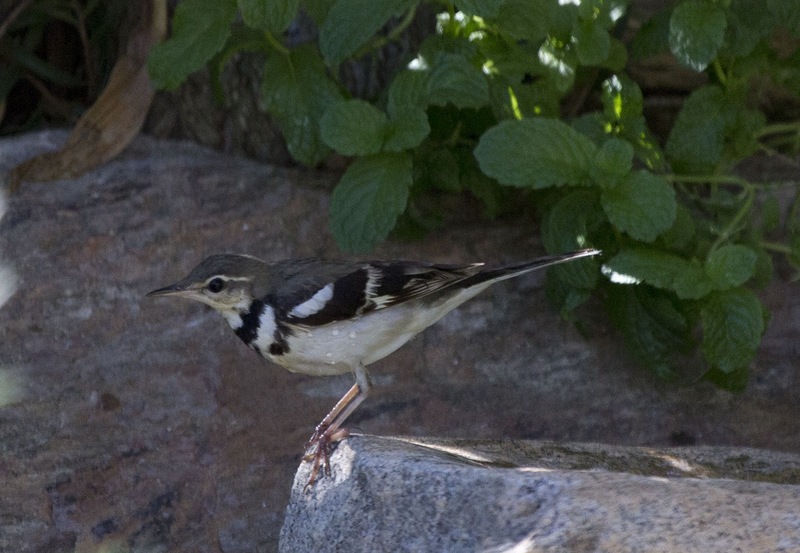 The Forest Wagtail is a very pretty little bird. It breeds in southern China, then migrates to Asia. Last week one turned up in a suburban back yard in Alice Springs. Of course I had to go and see it. Yes, I know it's a lousy photo, but at least it proves I saw the bird! I heard about the bird on Monday, but was busy indexing my next book and couldn't get away until Wednesday. I arrived in The Alice just after 11 on Wednesday morning. 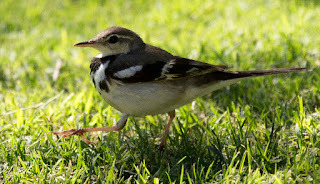 Within a couple of hours, I'd had great views of this dear little Asian bird and added another tick to my life total. Mike Carter (Australia's best birder) and his charming wife, Patricia, were on the same plane from Melbourne and kindly gave me a lift to the b & b where the bird had been seen. A small group of avid twitchers had arrived to witness this special little bird. 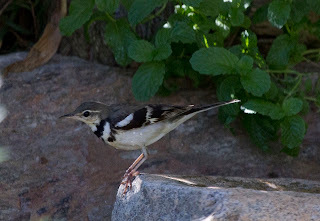 The Forest Wagtail obediently put on quite a show, walking around the garden, splashing in some water, eating an enormous caterpillar in rather spectacular fashion and living up to its name by wagging its tail, which in fact was more like moving all of its lower body, not just its tail. I thought it was much prettier than the photos on the web had shown, and more colourful. I'd expected a black and white bird, but it had a warm pale brown back and some pale lemon on its throat. Of course I thought it was pretty. It was a beautiful, unexpected tick. On the way back to Melbourne from our trip to Port Stephens and Barrington Tops National Park, I planned two stops: Wollongong for a pelagic, then a couple of relaxing days birding at Gipsy Point. Both these spots feature in my top 100 Australian birding sites. This was the third pelagic I'd booked in 2013, but the first to actually go. The weather was perfect. I was delighted that the boat was only half full, so I had excellent, unblocked views all day. We did not see a lot of species (I recorded 17) but we certainly saw a lot of albatrosses. At one point there were over 50 surrounding the boat. They were mainly Black-browed and Shy, but there were also Campbell's, Yellow-nosed and Buller's. ﻿Wollongong pelagics are run by SOSSA - the Southern Ocean Seabird Study Association. On this trip they banded shearwaters (Flesh-footed and Wedge-tailed) and Yellow-nosed Albatrosses. We saw both Pomarine and Arctic Jaegers, the latter identified by its aggressive behaviour. The only petrel we saw was a Providence (that the New South Welshmen insist on calling 'Solander's') and the only Storm-Petrel was a Wilson's. I think everyone on board would agree that it was a very pleasant day at sea - not something you can often say about a pelagic. And then it was off to Gipsy Point in far east Gippsland. The best bird I saw on the way was a Brahminy Kite. I've never seen one so far south before. At Gipsy Point we stay in the (modestly named) Luxury Lakeside Apartments. The name may not be humble, but neither is the accommodation. This is one of my very favourite places. They feed the birds each evening and afternoon. Galahs, King-Parrots and Little and Red Wattlebirds screech overhead. 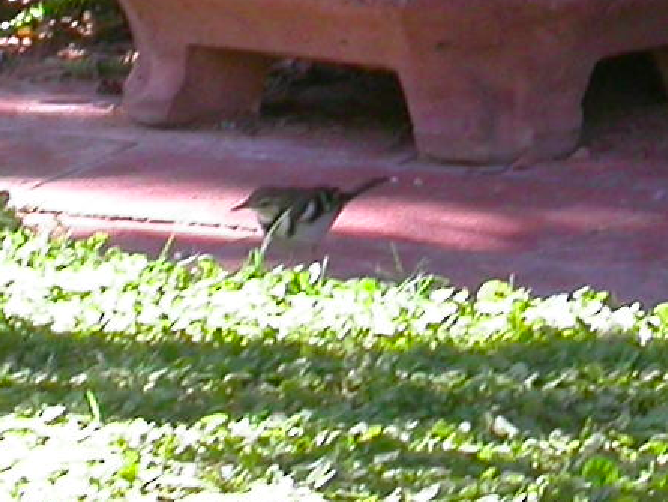 Eastern Whipbirds play on the lawn, quite unafraid of people. A Buff-banded Rail was on the lawn right out in the open when we arrived. Sometimes there are frogmouths roosting in the eucalypts, and sometimes White-headed Pigeons. There are always Bell Miners and Red-browed Finches, kangaroos and swamp rats. I always take some blue treasures as offerings for the Satin Bowerbird. He accepts my gifts, I like to think gratefully. We always drive into Mallacoota to see what we can see at Captain Stevenson's Point (on this occasion, there were teal, terns, godwits, oystercatchers and Eastern Curlews). I do as many walks as I can. I was delighted to see that a new coastal walk has been constructed for me to add to my list. I usually do Double Creek (looking for Wonga Pigeons and lyrebirds); Heathland (hoping for Ground Parrots, which I have never seen here); and Casuarina Walk for bush birds. In Mallacoota, we saw a pair of Glossy Black-Cockatoos sitting on the electricity wires. They did not hang around for a photo, but we were happy to have seen them. We had thought that April may have been too late, and they may have left on their northern migration. Sadly I could not find any Hooded Plovers on Betka Beach, usually a reliable sighting. We often drive to Shipwreck Creek to look for Southern Emu-wren, Ground Parrots and Tawny-crowned Honeyeaters. I've heard the parrots here, but not seen them. I figure if I keep on going, one day I'll luck onto them. I see emu-wren more often than not, and I don't think I've ever dipped on the TC honeyeaters - until this trip. On this occasion, I did not see any of my target species. I did see a lyrebird (they featured in this holiday - I saw lots!) and a Bassian Thrush, but that was all that was noteworthy. Outside of school holidays, there are not many better birding spots than Gipsy Point and Mallacoota. 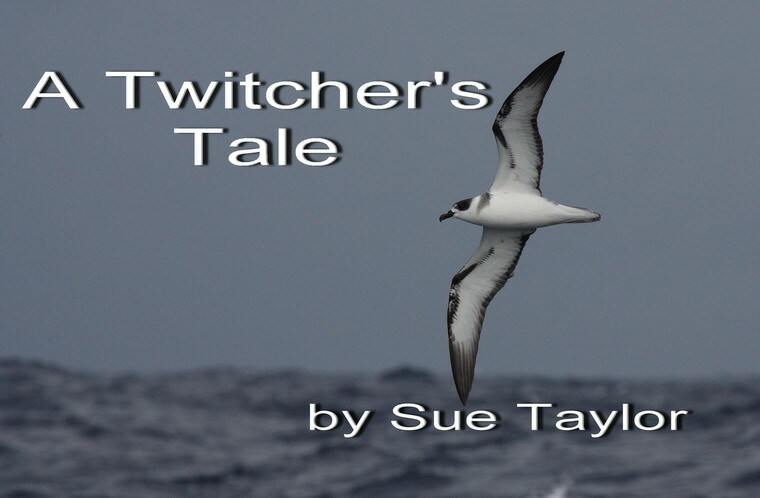 I've just returned from my annual trip north looking for White-necked Petrels. This bird (so beautifully depicted on the masthead of this blog by photographer Brook Whylie) is becoming a real jinx bird for me. Each year since 2008 I have driven north to Wollongong to do a pelagic either in February or March, when White-necked Petrels are supposed to be present. Or, more accurately, each year since 2008 Roger has driven me to Wollongong. Last year, we visited Wollongong in March, then went further north to Port Stephens to try again in April. I joined the pelagic from Nelson Bay on a Saturday. As usual, I came home disappointed. The boat went out the following day and got the bird! This encouraged me to try again this year. I booked the trip months ago and waited impatiently for April to arrive. I emailed Mick Roderick (who arranges the Port Stephens pelagics) asking rather cheekily if anyone local might help me to see their local grass owl while I was in the vicinity. This grass owl was another bogie bird of mine. I've spent many evenings looking for it in various parts of Queensland. Then, just to make sure that the trip had every chance of success, I decided to spend a few days looking for the Rufous Scrub-bird at Barrington Tops. On the way to Port Stephens, I birded at Wonga Wetlands (too little water, too few birds), The Rock outside Wagga Wagga and Migurra Walk near Cootamundra. We also did some touristy things - photographing Henry Lawson's birthplace at Grenfell, visiting The Dish at Parkes and spending some time at the Dubbo open plains zoo. The Rock is one of my top 100 birding spots. I'm surprised that it's not better known. The birding is usually pretty good. This was the first time I've ever been there without seeing Speckled Warblers. To make up for this omission, I did see lots of Scarlet Robins. I was impressed with a sign in the car park. One interesting observation I made on the Migurra Walk outside Cootamundra, was of female Golden Whistlers. According to the field guides, this bird should be the same race as the one I'm familiar with from my parents' property in north central Victoria. However, the Cootamundra birds had much more lemon on their undertail coverts. Nothing as dramatic as the Queensland females, but certainly more yellow than I'm used to. The best bird I saw on the drive from Dubbo to Port Stephens was an impressive Grey Goshawk, very white and very beautiful, sitting on the electricity wires. When I arrived at Port Stephens, Mick rang to say that the weather was unfavourable and the trip was cancelled! Taking pity on my having done such a long drive for nothing, Mick kindly offered to take me out owling. I was delighted. We went to Hexham Swamp, Mick fully prepared with spotlight and owl recordings. We waited until dusk, then Mick played his tape. Almost immediately an owl flew overhead. I couldn't see its dangling legs (the diagnostic feature of grass owls) and Mick cautioned that Eastern Barn Owls were also in the area. I was surprised at how dark the bird was. I'd been expecting a large white owl. Before I had time to regret that I hadn't had a better look, another beautiful owl appeared, this one with obvious dangling legs. Seen in the spotlight, it was indeed a large white owl. No doubting its identity: it was an Eastern Grass Owl. Yippee! A lifer! Thank you, Mick! Of course I regretted the absence of White-necked Petrels, but the grass owl more than made up for it. I know I will see the petrel one day. Rog and I then drove to Gloucester. Several members of the Hunter Bird Observers Club (Mick is the president) had been extremely helpful in giving me information about where to see Rufous Scrub-birds in the Barrington Tops National Park, and, more importantly, how to see them. I've looked for them several times before, both at Lamington National Park and at Barrington Tops. I've heard them on many occasions, but have never come close to seeing them. I knew April was not the best month to look (October is best, when they are singing most territorially) but I figured seeing these birds is simply a matter of luck, and the more time I spent looking, the more likely I was to be lucky. Thanks to the Hunter experts, I knew of seven territories, and over three days, visited each of them at least three times, some sites up to five times. In all this time, I heard one bird call. It was about 25 metres away in very dense scrub. (They're not called 'scrub-birds' for nothing.) I tried to go closer, but the scrub was too dense for me. So then I tried to encourage the bird to come nearer to me, with various (I thought endearing) noises - whistling, pishing and so on. The bird remained quite indifferent to my pleas, and did not move one millimetre closer. After 45 minutes I was all pished out and gave up. This may sound as if I gave up too easily, and, if the bird had moved a metre or so nearer, I would certainly have kept trying. But he didn't move at all, and I could see no point in continuing. I will try again in October in Lamington National Park. I should have more luck then (especially as I have already arranged a professional guide to show me). Ticks are becoming harder and harder to come by. I came home, not disappointed at the lack of White-necked Petrels and Rufous Scrub-birds, but absolutely thrilled to have seen an Eastern Grass Owl.